Robert Frost called them "flying flowers." Artists and children delight in them and lepidopterists study them. As a gardener, I am forever enchanted by the visit of a brightly colored butterfly with its velvety wings-especially at the most unexpected time while slaving away at weeds or dividing. It's like a friend stopping by who appreciates your garden. Fritillary upon your viburnum, like night moths visiting the nicotiana, or dragonflies and damselflies in the meadow, offer an unmistakable extra pizzazz to the garden. And they always seem to appear at that impromptu moment. Or is it impromptu? Actually, much can be done to coax them into your garden. A few facts: of the Insecta class and the Lepidoptera order, they form a complete metamorphosis. Approximately 200 species exist in New England, ranging from the Great Spangled Fritillary to the Eastern Tiger Swallowtail and the Question Mark. Cold-blooded, they thrive on warm sunshine and absolutely shun windy conditions. To attract butterflies, we need to make only relatively small changes in our current practices and styles," states Alcinda Lewis in "Butterfly Gardens," published by the Brooklyn Botanic Garden. As usual, habitat is crucial. In the wild, many clues are offered on attracting these pollinators upon which so many plants, such as milkweed (Asclepias) or Joe-Pye weed (Eupatorium), depend. Leaving some areas undisturbed, e.g. not mowing your field, is important for the development of the butterfly's larval stages. More specifically, milkweed provides food for this instar stage of that most fascinating butterfly: the monarch. Tall grasses or a weedy patch provide a "nursery" for females seeking a safe place to lay their eggs. Of course, limiting the use of pesticides, as endorsed by IPM, is crucial. With good sun exposure, a warm rock to rest on, protection from wind and availability of water, the home gardener can attract these wonderful creatures. A crucial ingredient for coaxing, however, is nectar-producing flowers. To enjoy regular visits, plan a successional garden, with grape hyacinths and lilacs in spring; perennials such as Echinacea, Echinops, Rudbeckia and Monarda as well as an array of herbs (dill and parsley if left to flower will attract the black swallowtail) in summer, and purple asters in fall. Plant in clumps and at varying heights; butterflies prefer to flit about. Shrubs such as Viburnum, Clethra, mock orange and, of course, buddleia (the butterfly bush) will both protect from windy conditions and offer nectar-providing flowers. For male butterflies, a little salt in a mud puddle is also recommended. Where do native plants fit in here? As it turns out, most adult butterflies are not fussy. They will gravitate toward a Chinese or South African delicacy as well as any American "dish." However, for their more vulnerable egg and caterpillar stages, native plants are often essential. 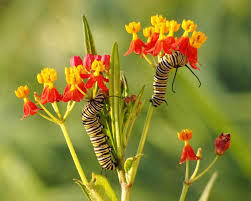 For example, the orange and black Harris' checkerspot caterpillars feed only on tall, flat-topped white asters, and the monarch caterpillars on milkweed. Finally don't worry if you're singing in the garden. 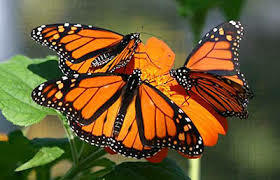 Along with others such as damselflies and dragonflies, butterflies are deaf. You can holler or sing and they won't budge -- an advantage to the more hushed demands of bird watching. For more information: the Taylor Guide "Attracting Birds and Butterflies," by Barbara Ellis; "Butterfly Gardens," published by The Brooklyn Botanic Garden; and "Butterfly Gardening in New England," published by The New England Wild Flower Society and The Garden Club Federation of Massachusetts.